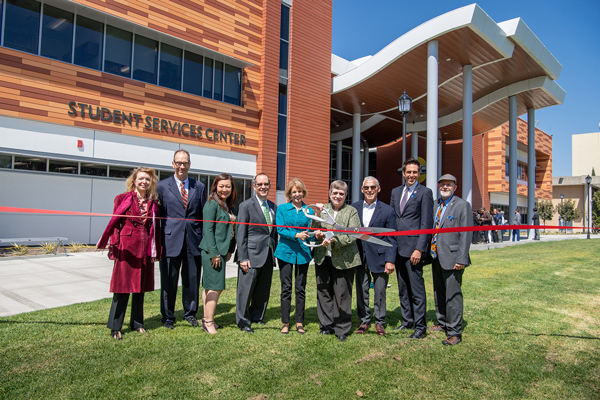 Golden West College hosted a grand opening ceremony for its new Student Services Center on Thursday, May 3, 2018. Ground broke for the structure back in April 2016, and almost two years later the Student Services Center opened its doors. The building’s design is welcoming, and the open layout is student-focused. “The building stands in the center of campus because students are the heart of the college,” said Dr. Claudia Lee, GWC VP of Student Services. The goal for the new building is to provide the essential student services under one roof, including admissions and records, online orientation and assessment, counseling and the bursar’s office. The first floor of the new Student Services Center houses GWC’s Answer Center, where the staff is available to assist students and point them in the right direction. Computer kiosks greet students when they enter the building, so they can apply to college, complete their FAFSA, and register for classes. Campus Life and Global and Cultural Programs are a few steps away, providing student leaders and clubs a space to meet and organize. Financial aid and admissions and records are also on the ground level and located in the same area, further streamlining the application process. The second floor boasts an expanded computer lab, where students can complete placement exams, and the college can host workshops and training for both students and staff. After students complete their placement exam at the assessment center, they can meet with the counseling department on the same level. The Career and Transfer Centers, EOPS, CalWORKs, CARE and Guardian Scholars offer additional resources and benefits for students – all under the same roof. Mary L. Hornbuckle, President, CCCD Board of Trustees, said that student services on campus used to be “a maze, and now it’s amazing.” Ira Toibin, Measure M Citizens’ Oversight Committee, and Dr. John Weispfenning, Chancellor, CCCD, also delivered congratulatory remarks to the crowd of students, staff and community members. “Yes, this is a great building, but the people inside it are even greater,” said Nuran Alteir, ASGWC Executive President. District board members and GWC faculty and staff participated in the ribbon-cutting ceremony. Tours of the new facility were available to guests during the open house. The GWC Digital Arts Program has the largest MAC lab in Orange County.